Please choose rather 1 size larger than you normally take for street shoes! The LEKI Genius Carbon is not only one of the most sold Nordic Skating poles it is also extremely popular in cross country skiiing. It comes with the quality you would expect from one of the leading pole companies in the world. The LEKI Genius Carbon is extremly flexible and bendable. 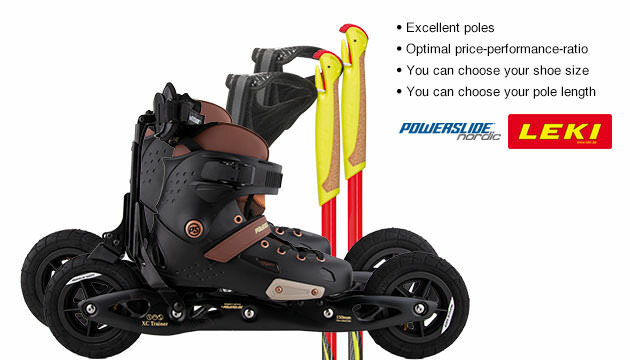 Powerslide XC Trainer 2 Vi is the allround model of Powerslide. The XC Trainer 2 Vi has one good brake and air tires. The XC Trainer 2 Vi comes with comfortable Softboots that are mounted on the frame and brings lasting fun and good workouts for beginners and advanced Nordic Skaters. 1 brake on right boot, the second brake is optional. V-mart air tires with 150mm diameter, 6 x 1.25"
You receive a free "How to start" brochure written in English with every pair of skates. V-mart Air tires 150mm diameter, 6 x 1.25"
The LEKI Genius Carbon is a high quality Nordic Skating pole by LEKI. It offers all you can expect from a Nordic Cross Skating pole. The pole is extremely well processed and it feels ultralight in your hands. The LEKI Genius Carbon comes with a 1 component cork grip and the Trigger Shark system. The straps are very easily to adjust, and the Trigger Shark system allows it to connect and disconnect with the pole in the most comfortable way. LEKI offers skating gloves that work perfectly together with this pole to make your Cross Skating experience even better.